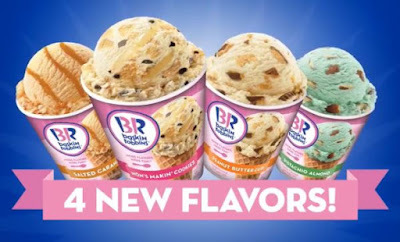 Several months ago, I was talking with Boardwalk Frozen Treats about their production of the Baskin-Robbins at home flavors that you can find in your local freezer aisle. In particular, I was having trouble tracking down a good supply of pints to dig in to. Long story short, I learned that they are coming out with four new flavors for 2016 and they gave me a bunch of coupons to try them. The new ice cream flavors are Salted Caramel, Mom's Makin' Cookies (the in store version is excellent), Peanut Butter Cup, and Pistachio Almond. To enter, simply enter your email address in the comments section for this post. Since comments are moderated, no one will see your email address except me. Once the contest is over and I've picked a few winners, I will send you an email to request your mailing address. Disclaimer: your information will not be shared with Baskin-Robbins, Boardwalk Frozen Treats or anyone else. I am not responsible for lost mail or freezer burned pints. I have twelve coupons but haven't decided how many coupons I will send to each winner (but it will be at least two). Let's call the contest deadline August 16th at 10 PM EST (aka you have two weeks to enter). Mailing addresses in the United States of America only and remember, if you don't enter your email address, I can't contact you and let you know that you've won. Update: Congrats to our winners Mary, Carlos, Megan, Matt, Joshua and Kimberly! Sorry, life has been a little crazy this last week... or two? really, it's been two weeks already, man that's just sad. I will send emails out tonight. Since I used the comment system as my entry form, I had to copy everything out, clean it up, and prep it for random selection but by the time i did all that I was tired and went to bed. So it took several days to get to prepping the list, and now several more days to get back to picking the winners, but I will do it tonight!